Lately, whenever I start fretting about politicians and deficits and the thousand natural shocks that flesh is heir to, I remind myself that I will soon be going to the Deschutes. The salmon flies will be hatching. The redsides will be beside themselves. I will be right there in the thick of it. 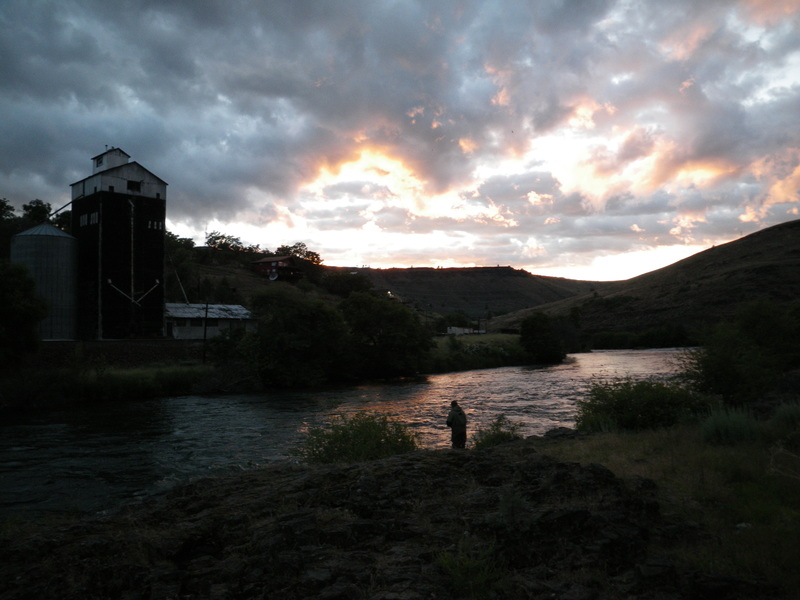 For a fly fisherman, this is the formula for bliss, and I can’t wait. Last year was my first encounter with the salmon flies and the redsides, but I’d been itching to fish the Deschutes since I first laid eyes on it. That was on a family trip, and I didn’t get to cast a line, but I did pull off the road to look at the water and try to wrap my mind around what I was seeing. To the eyes of an Eastern angler like me, the Deschutes is big, serious, scary piece of water, and it defies just about every expectation I have of a trout stream. 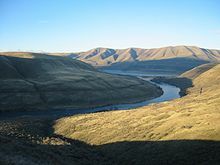 For one thing, the Deschutes serpentines through the high desert of central Oregon, flowing through a gorge abut 300 feet below the level of the surrounding plateau. The walls of the gorge aren’t always steep, but they are rugged, rocky, and reddish-brown — a far cry from the lush, green landscape of the western Cascades, where the rivers crash and splash down through the ferns and towering trees of the boreal forest. On the Deschutes, a few trees cling to the lower slopes, but most of the gorge looks barren and forbidding, a better habitat for rattlesnakes than for people. But if the Deschutes isn’t a classic beauty of a river, but it is still mesmerizing. It just seems so improbable — impossible, even — that this cold, swift, powerful torrent has cut its way through this arid country. It doesn’t seem to belong here at all. It’s like discovering that a grizzly bear has taken up residence in your fallen-down garage. That first day I stood on the bank, I heard the rustle of the water, a steady, surging sound, and watched the impatient currents pile up, the whole surface of the river seething with a kinetic, restless energy that I could feel through the soles of my shoes. The sensation was like standing near the railroad tracks when a freight train rumbles by. 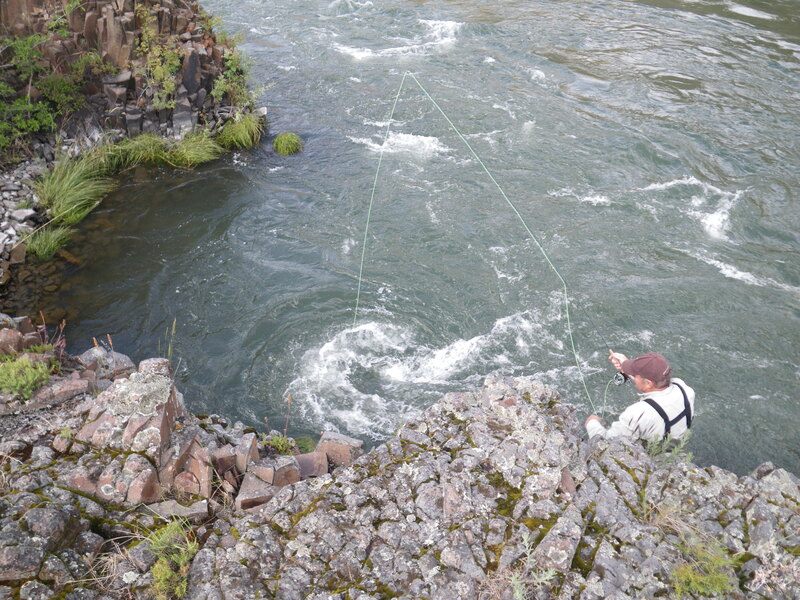 Since time out of mind, the Deschutes has been a bountiful fishery. 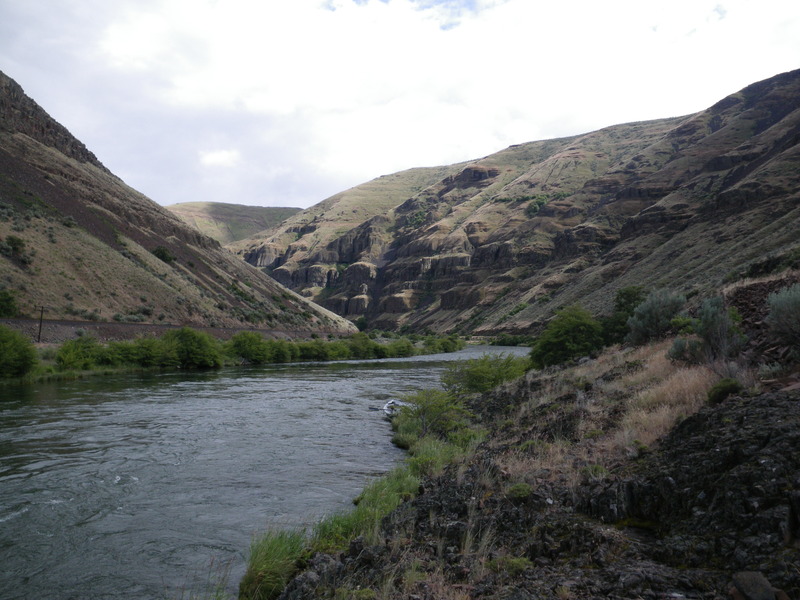 The tribes who settled this high desert made a ritual of catching salmon, and their descendants follow the ancient practices (much of the west bank of the Deschutes is tribal land belonging to the Warm Springs Reservation). 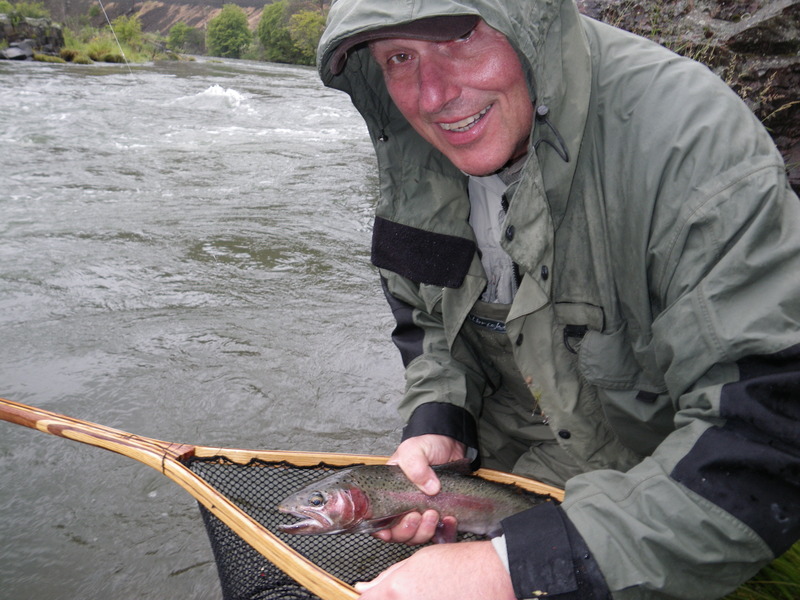 More recently, sport fishermen have flocked to the river to fish the fall run of steelhead. But in late May, the fishermen come for the redsides, the wild rainbows who won their name because of the brightness of their stripes. 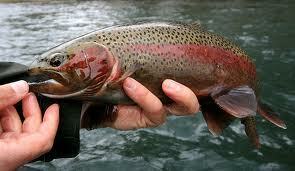 A hatchery rainbow has a pinkish stripe; a redside, fresh from the river, is marked with a slash of intense red. The redsides are also, rightly, noted for their fight. 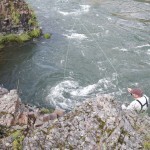 In the strong currents of the Deschutes, the trout develop muscle and heft. Any redside over 20″ may be considered a “pig,” and I can say from experience that any redside over 15″ can make a reel sing. Like the river itself, these trout command respect. Lesson #2 was that most salmonflies would be close to the bank, very close. Matias and I had walked along the bank, parting the tall canary grass and peering into the tangled brush to get a close look at the hatched-out salmonflies. Maybe we’d missed the peak of the hatch, but there seemed to be thousands of big, clumsy, brightly marked bugs, big a baby’s finger. Actually, we were looking at two kinds of flies — golden stones and salmon flies, which hatch at the same time and are about the same size. The salmon flies show orange under their diaphanous wings, and the golden stones are a buttery yellow. Like terrestrials, they tumble into the water, and they often get gobbled up before the currents can sweep them away from shore. This all seemed self-evident, but somehow or other I had imagined that fishing the Deschutes would be a matter of long, elegant casts to fish rising in mid-stream. Instead — if I fished dries — I’d be working in close quarters, keeping the fly in tight to the shore, trying to stay clear of the brush and overhanging alders, casting to get a good drift in the deep slots near the bank. Lesson #3 came from the water itself, and it definitely got my full attention. Our plan was to drift down a few hundred yards and plant ourselves at the tail end of a little island, and Ken had given me the easiest craft to manage, a pontoon boat. He reminded me of what I already knew, that the current was strong. I had a couple of oars, the boat floated high, and after a couple of spins on a bit of slack water, I eased into the current . . . and realized I wouldn’t be stopping at the island. Sailed right by it. I wasn’t getting off till the water slowed down. I was going to have to put more oomph into my oarsmanship. And so the first day unfolded, with me scrambling to assimilate new information and put it to use. We floated about 4 miles that day, part of what Ken and Mateus called the “parade.” Other boats did pass with regularity, but there seemed to be plenty of water for everyone, especially since it took a while to get into position to work the most promising spots. The salmon flies were out in force, and they must have looked like big cheeseburgers to the trout, but the redsides haven’t survived by being stupid. They might be in a feasting mood, but the best fish had chosen stations that were well-protected by rocks, or overhanging brush, or fallen timber. The MO of the day was to locate one of these redside fortresses, figure out the best way to approach it, and then — moment of truth — hold our breath when we were finally in the right place and making the cast, since that first presentation had to be spot-on. Since I am the one writing this article, I am not going to say how many fish I caught that first day. I will admit that I broke off on a good many and switched to a stronger leader. I will also admit that, following Ken’s lead, I fished nymphs for a large part of the afternoon. This was a bigger deal for me than for him, since he carried — like most old hands on the Deschutes — three rods, one rigged for dries and two rigged for nymphs, enabling him to change tactics at a moment’s notice. I had to change leaders and tie all those infernal knots. About that first day, I remember the many redisdes that I did not land. I remember admiring Matias, who scorned nymphs and kept making his beautiful casts. I remember sitting by an eddy where I’d just given up on catching anything when another fisherman walked by, and asked if I minded if he tried a cast, and tied into a redside on his first cast — a 3-pounder, by far the biggest fish I saw all day. It was dark when we go off the water, tired, hungry, and filled with a desire to do better on the following day. I could already sense that there would be a guide in my future. I didn’t immediately dial Guide-1-1, but three weeks later, on a business trip to Portland, I arranged to stay two extra days and booked a guide in Maupin. It was now mid-June and the salmon fly hatch was over; further, the river was still a bit high. When I left Portland in the darkness and drove through the Columbia Gorge in sheets of rain, I had to tell myself that the best days on the water often begin in doubt and adversity, and I pressed on. The rain did settle down to a steady Oregon drizzle, and my guide, Nate Morris, was waiting for me at the Deschutes Canyon Fly Shop. He didn’t seem optimistic. He was about my son’s age, fresh-faced but quiet and business-like as we loaded the gear into his rig and set off. He didn’t make any false promises or give me any sort of pep talk. Heading downriver, he kept looking at the water to see if it was discolored by runoff. We passed the Class IV rapids that provide the finale for summer whitewater trips, and kept right on going past Shearer’s Falls, where the Indians have built platforms to net for Coho salmon. “At least we’ll have the river to ourselves,” Nate said. We hadn’t seen a single boat. To my eye, this place wasn’t so different from the others — a steep, rocky bank that sheared into the water, a current with the usual active, striving hydraulics. The water was clear enough that I could see some big rocks on the bottom, maybe six feet below the surface, that might provide redside shelter. Again, I got a couple of quick hits, but struck too late. 0-for-5. I kept casting, and Nate kept fussing with the rig and changing the flies, as guides will do when desperate. He didn’t want to leave. I finally picked up a respectable redside. 1-for-6. The weather hadn’t changed, not that I noticed, but somehow or other that first redside turned the tide. All of a sudden, the trout were feeding. It might have been the fly, an ordinary caddis that Nate had tied on as the dropper, or it might have been the little bead of split shot he’d added to the leader. Or maybe they just heard the dinner bell. Anyway, they were taking with more conviction, and my average started to rise. 2-for-8. 4-for-11. 7-for-15. Most of the redsides were in the 12-14″ class, standard for the Deschutes, and they were frisky. When I started to wonder if we overdoing it, Nate — stationed on the bank beside me where he could see the fish — assured me that there were plenty more in this slot. Before we left that treasure trove, Nate led me upstream to a place where a big boulder had tumbled into the river, forcing the river through a narrow gap. Where the water sluiced through, it was almost black, and other boulders guarded the back door. It was a perfect spot for a big trout, and we saw a rise. “That’s the one,” Nate said. “Can you get a bow-and-arrow cast in there?” I thought I could if I could manage to stay upright. He’d tied on a small dry, and I held on to it, and made the bow-and-arrow cast, which is sort of like shooting a spitball with a rubber band. The length of the cast was about 8 feet, the length of the leader, and the float was about 2 inches — WHAM! The redside hammered it, and I played and landed the fish in there among the boulders, and I was through with counting for the day (though I have to mention that this fish measured 18″). In the picture, I’m in my rain jacket, but the drizzle soon cleared off. The sun actually peeked out a couple of times, and we weren’t in any hurry now. I like catching trout, but I don’t have an urgent need to run up the numbers of fish I catch, especially not on nymphs fished deep. Nate understood this, and made it his mission to show me different kinds of water that afternoon. In the course of that afternoon I saw the long glides where the steelhead lie, the sandy spawning beds of the redsides, and one formation, round as a well, where the river rushes in and whirls in a vortex. With Nate to point out the changes in hydraulics and the slight shading of the water, I felt that I was beginning to be able to read the heavy riffles, though I’m not sure I could do it on my own. And I began to understand that the deep slots he preferred were not all alike, and that in my impatience with nymphing I was missing, shall we way, the finer points. For several hours, we were stalked by a grumpy-looking heron. I never saw it fly, but it seemed to appear on the bank wherever we fished, watching us more like a game warden than like a scavenger. And we saw a couple of freight trains lumber by on the tracks that hug the west side of the river, which set Nate off on a discussion of the Deschutes railroad wars. It’s odd to think that this valley was once the battleground for two mighty railroad barons, but they both had crews on the Deschutes, competing to see which could finish the line first. The tracks still provide river access for the hiker, and on the eastern bank, the old railbed (there’s even a tunnel) serves both hikers and vehicles. That afternoon we had a long, companionable conversation, and we saw exactly two other fishing boats. Really, it seemed that we had the river to ourselves, and the point was no longer catching fish but being on this remote water. We did fish a couple of Nate’s choice spots, and he kept untangling my wind knots, but mostly I was just soaking up the day, realizing that I would never know this or any other stretch of water as well as Nate did. And I also realized that, despite its many challenges and difficulties, the Deschutes had more than fulfilled my expectations. I’ve had the good fortune to fish a number of famous Western rivers, but the Deschutes is in a category of its own — not so pretty, ready to punish any miscalculation, ornery, and just plain tough, a river where the defiant individuality of the West endures, in the redsides, in the history, in the landscape and in the people who make the river their calling. I did bring a few 15 and 16 inchers to the net, and I was completely happy when we loaded up and headed back to Maupin. In the twilight, we saw an Indian on one of the plaforms above Shearer Falls, perched and immobile, poised with his long-handled net above the churning, white water. As the day’s final image, that one would have done just fine, but Nate had one more stop in mind. Not far from Maupin, we pulled off at a spot where the water seemed to quake and tremble. There was a massive evening hatch underway, but the light was so low that I could only cast toward the sound, not toward the ring of a rise. In the half hour as night came on, I must have landed at least half a dozen redsides, fishing by feel and instinct, casting the spent caddis as well as I could toward the splashes I heard. Nate, as usual, was behind me, and he could see some of the rises, but we were both giddy when the light finally failed, laughing like a pair of kids. Nate Morris maintains a blog of his own that coveys, in pictures and prose, more of his knowledge and experience of the Deschutes River. In Maupin, I stayed at the Imperial River Company, a clean, comfortable lodge that sits right on the Deschutes. You can literally fish for redsides from the lawn. After our day, Nate and I showed up late at the Imperial restaurant, but they kept the kitchen open and served us delicious steaks. Each room at the Imperial is individually decorated, and the lobby has a trove of information about the river and the area. 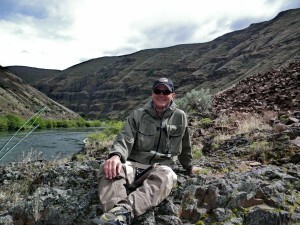 The Deschutes Canyon Fly Shop, in addition to providing all the tackle one might need for the Deschutes, offers guided trips to many different kinds of water in the area. Also located in Maupin is Deschutes Angler, another fine tackle shop with a full range of services, including a center for Spey casting. Anyone making an extended stay in central Oregon should consider staying in Bend, with its excellent restaurants and hotels ( my favorite is the Old St. Francis School , run by the whimsical McMenamins). There are many outfitters in the Bend area who can arrange floats on the Deschutes, and The Fly Fishers Place, in nearby Sisters, Oregon, not only has a line-up of excellent guides but maintains an informative website with up-to-date fishing reports. Stephen Goodwin, the author of "Dream Golf: The Making of Bandon Dunes," was a contributing editor at Golf Magazine. He has written extensively about golf course design and golf history, and his articles and essays on golf have appeared in Golf, Links, The Met Golfer, Golf Connoisseur, The Washington Post, The United States Open Open Program, and The Masters Annual. 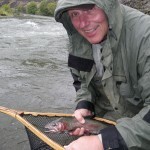 Your article spoke well of the magic of the Deschutes. The Deschutes is truly a remarkable river and the annual appearance of salmonflies is unquestionably one of the high points. However, the Deschutes is remarkable and arguably unique for at least two other reasons. The most obvious is the presence of its legendary steelhead run on the lower river. While there is great joy to be had during one of the Deschutes River’s notable dry fly hatches, I’d argue that there’s nothing quite like wading into the cold river in the half light before dawn to methodically swing flies on the chance that a wild Deschutes Steelhead lurks below. The old saw about a 1000 casts to a hookup is probably an overstatement. Yet, it’s hard to argue that standing in a cold river at the bottom of a desert canyon, swinging flies on the surface for a wild steelhead is anything less than meditative. Of course, we all hope to hook one of these silver bullets, fresh back from its mysterious journey to the north Pacific. But expecting to hook and land one on a given cast or on any particular run is as good a lesson in humility as I can imagine. The second remarkable thing about the Deschutes is the simple fact that after all these years, it’s still health and in fact continues to getting healthier. The Deschutes has certainly seen its share of abuse over the years, from overgrazing of livestock to a race between two railroad barons up either bank, from the construction of three massive hydroelectric dams near Warm Springs to the seasonal invasion of splash and giggle boaters, as well as from the withdrawal and manipulation of its flows, first for agriculture and increasingly for its growing towns and cities. For generations, Portlanders and many other Oregonians have viewed the Deschutes as “their” home river. They’ve floated it, they’ve fished it and they’ve often fought to protect it. But for many of us who live on the high, dry plateau east of the Cascades, the Deschutes River shapes and helps define who we are or at least think we are. And despite the indignities that the river and its tributaries have suffered, the future is looking favorable. Most notably, the three giant hydroelectric dams that plug the Deschutes Canyon and block the free flow of the river are no longer an impenetrable barrier to the annual migration of sea run salmon and steelhead. This turn of events is over 40 years in coming and is both an unprecedented engineering feat and a testimony to the stubborn desire of Oregonians to bring salmon and steelhead back to their home river. Today, that desire is playing out on the rivers and creeks, stream banks and uplands that contribute the waters that are the Deschutes. 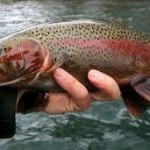 A unique partnership between four community-based nonprofits known as the Deschutes Collaborative, with active support from our local communities and a host of public agencies is restoring, reconnecting and protecting the upstream habitat needed for the historic return of wild salmon and steelhead to the upper Deschutes Basin. The Deschutes is a very special place and fortunately, Oregonians are committed to keeping it that way.